The owner of the Stride Rite shoe store in my small town growing up promised to give me a beautiful doll with a blue gown, encased in a plastic dome case, which was on display in the store if I took part in a fashion show that my mom’s women’s club was putting on. (I was six years old, shy and very reluctant to do it; obviously my mom or I had told her about it.). That doll was SO beautiful to me and such a motivator! After the style show was over, she did give it to me. And I never forgot her kind gesture! My ex-husband, my 18-month old son (at the time) and I lost everything we owned in Hurricane Huge in 1989, and our renter’s insurance wouldn’t pay a cent. My best friend from junior high and high school, Sue, who I hadn’t seen in years, sent us $100. I was an at-home mom, and we were all young and pretty poor then — and it was such an incredibly generous thing for her to do. My friend Barbara, who’d been in a mother’s group I started when our children were about six months old, had moved away – but after Hurricane Hugo, she sent me a big box of clothes. Since I’d lost every piece of clothing I owned except for the three shorts outfits I packed when we evacuated, I wore those clothes for years afterwards – and always appreciated her kind gesture. When we were in our early 20’s, and my ex-husband had been laid off from his job quite a while, my sister, J, paid for me to go on an all-day “cruise to nowhere” in Florida with her. I’d never been on any kind of cruise, and we had such fun! We still joke about the foreign staff members saying over and over to us, “You are sisters! !” That extravagant one-day trip was a real spirit lifter and a really generous thing to do. She’s done many other kind and thoughtful things over the years, but that cruise really stands out in my mind. My ex-boyfriend brought me a bouquet of flowers every week for five years! My friend, Mary C., made a phone call about a job opening at her husband’s company and that led to a wonderful job opportunity for me, thanks to her belief in my abilities. After I broke my foot several years ago and had to have surgery and be in a wheelchair for four months, my friends from work, Mary O. and Nancy, took their half-hour lunch break to drive 30 miles round-trip to my house and deliver a second mattress (from Mary’s couch) for my couch (where I’d been sleeping because it was on the ground floor) so that it was nice and comfy. After four months, they both took another lunch hour and went back to my house to pick it up! Nancy also took me to get a pedicure on the foot that didn’t have a cast on it! My friend, Joy, who – when we hadn’t know each other that long – made me about 20 pairs of beaded earrings and displayed them on a beautiful Zentangle design she drew and mounted on cardboard. It must’ve taken hours to make everything – and I was blown away by such a generous gift! Once when my son was about 3 and my ex-husband was in college and I’d had a sinus infection for days that was dragging me down (and didn’t know any babysitters), my friend Kathy picked my son and me up, drove us around on errands and to playgrounds with her daughters for a whole day, giving me much-needed rest. Kathy also washed my hair in her kitchen sink and sat me at the table for hours doing her best to fix my hair after the worst haircut of my life! My friend Cheryl came over to my house at 3 a.m. when my son was young and I called her in the middle of the night thinking I had appendicitis. Now THAT is a friend. She’s also been my “partner in crime” in several madcap capers over the years. The women in my mother’s group rented a room at a local restaurant and had a surprise 39th birthday party for me right after my ex-husband left. What a wonderful gift! The people I worked with at my government job took me out to lunch and all gave me gag gifts right after I finally got a civil service job (after being a contractor for five years). Most people aren’t lucky enough to have those kind of coworkers! My son and his wife gave me the best physical gift ever on my milestone birthday this year, when I was suffering from a recent breakup with the former boyfriend mentioned above and a severe case of empty nest blues after they moved to another state: a typed booklet, tied with ribbon, titled “Things We Love About Diane.” I laughed and I cried — and that book is so precious that I made a color copy and put it in my safe deposit box! The wonderful women in my book club gave me an unexpected birthday dinner this year – complete with flowers, gifts and a balloon bouquet. We really livened up that restaurant! They also spent hours helping me make wedding favors for my son’s wedding. My friend and former business partner (we wrote a book together) Chris was able to sell the business when we were ready to retire from it — which, with my share of the proceeds, enabled me to buy my house. She also recommended me to a friend, which resulted in me getting a job as a corporate trainer in a prestigious local company. She’s an amazing person. I haven’t mentioned my parents — because I couldn’t begin to count all the kind and generous things they’ve done for me and my son over the years! They’re the best. I hope that you, too, are lucky enough to have family and friends like mine — and that you appreciate the things they do for you. This entry was posted in blessings, family, friends, gifts, gratitude, life, memories, miscellaneous, nicest things people have ever done for me and tagged best gifts, blessings, family, friends, gifts, nicest things people have ever done for me, thoughts tips and tales. Bookmark the permalink. It’s so important to count our blessings (large and small). Thanks for sharing. What an incredible honor to be mentioned by one of the finest people I have ever known. One of the nicest things people have ever done for me was to invite me to join her in writing a book that was all her idea. That’s really nice of you, Chris – thanks. Diane, What a wonderful list! You are blessed with many special people in your life. This is just the best! Thank you for linking at CMB! Thanks so much, Deb! 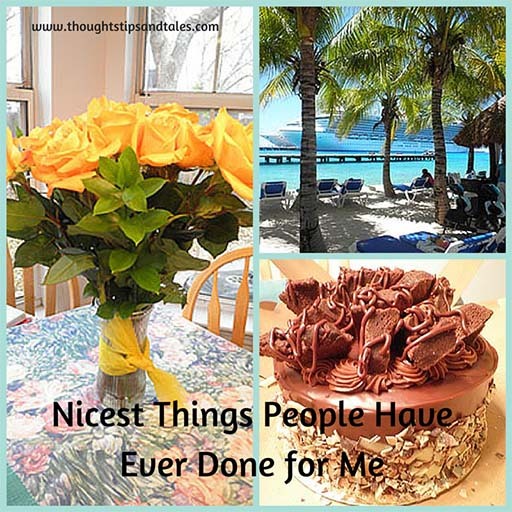 I am blessed, and think it’d be nice if everyone could sit down and make a list of the nice things people had done for them (especially on their bad days)! Thanks for commenting. I should read this list more often to remember the great people in my life! And it would be nice if everyone could sit down and write their own list, and re-read it often, too. Such beautiful people in your life. So happy for you. So happy you recognize your blessings. Thanks for commenting. You’re right that I was blessed to find beautiful people in my life! It is indeed a precious gift to be able to look back and give consideration to and thanks for the wonderful people God has brought into your life. What you reap you sow ~ I imagine you a real giver and lover of others.